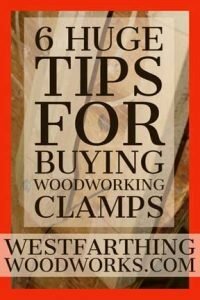 This is 6 Huge Tips for Buying Woodworking Clamps, your guide to getting a killer deal on woodworking clamps for your shop. 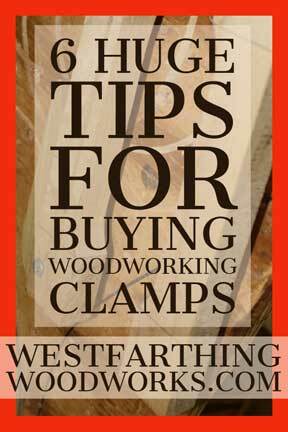 You are going to need a lot of clamps as a woodworker, so you might as well not pay full price. Here’s how you do it, enjoy. One of the things that you’ll discover as a new woodworker is that you need a lot of clamps to do just about any project. I’m sure you’ve heard the phrase that a woodworker never has too many clamps, and though it may sound funny now, it won’t after a while. Clamps are just one of those necessary items that help you with so many different operations in woodworking. They are extremely important, and thankfully they come in all different sizes and shapes to help you out. As you add to your collection, the total cost of your clamps can go up very quickly. In fact, if you have many clamps, and you add up all of their prices, it could go upwards of the same cost as a large power tool. Thankfully for you, I have six different ways to show you where you can reduce the cost of your clamps, and still get good quality tools. Here’s the list, and I’ll go into each one of them in more detail coming up. Something you’ll discover about tools, especially tools that have been taken care of well by their previous owners is that used tools and new tools are not that different. You really can’t do very much to a clamp shy of abusing it to make it not work as well as a new clamp. It’s very different for tools that have motors in them, which wear out over time even with careful and caring use by the previous owner. Things like hammers, chisels, and tools without moving parts tend to do just fine as long as they were cared for. That being said, start your search in the used market looking for clamps that have light wear and look as though the previous owner loved them. Don’t buy anything that looks super beat up or that doesn’t seem to work very well. Woodworking as a hobby, just like any other. There are people that like to hobby-jump and you may end up finding someone that went all in on woodworking for a grand total of six months, and now they’re looking to dump their tools to fund their next hobby. This is a huge opportunity for you, because you get a bunch of tools at a discount, and it’s a benefit for them because they get to move onto the next hobby. This is one of my favorites, and every single year I buy clamps from a home improvement store because they are on a deal for Christmas. If you look in the home-improvement stores at their stack out bins for gifts, you can typically find deals on clamps. One of the deals that I found involves getting six clamps in a blister pack that normally sell for $15 a piece at a higher end woodworking store that I frequent, and the entire package was less than $20. These are name brand clamps, and every year I buy a couple of packages. The price savings is tremendous, it’s basically like buying one clamp and getting five more for free. Some years they do different deals, but it’s always about $20 for nearly $100 worth of clamps. Go into your local home-improvement stores and go right to the stack out bins where they have easy gift items on display. This is where you will find deals on clamps, and most things in this area are inexpensive. If you find a deal that you like, especially as a new woodworker, feel free to go a little nuts in the beginning and spend some money. For the cost difference versus buying them individually off-season, you can fill your shop with clamps for a fifth of the price. When I first started buying larger clamps I ended up spending $40 a piece on two large bar clamps. The last blister pack that I bought as a seasonal stack out had four of those clamps in it and it was only $20. It pays to look around. Thanks to the internet, the marketplace of the world has been shrunk to fit in the palm of your hand. You can literally buy woodworking clamps from any tiny corner of the world that you want to, and have them shipped directly to your house. The biggest player in this global marketplace is Amazon. They are a trusted resource for many people, and all of the merchants on there are competing on price and quality to win your purchase. This is a great deal for you as a consumer. The benefit of stores like Amazon is they don’t have the overhead costs that brick and mortar stores have to deal with, like rent, utilities, and increased manpower. This means they can deliver the same product for less money, and maintain the same margins. Take a look on Amazon and search for woodworking clamps to see what you can find. You’ll be amazed at all of the different types, then you’ll also be very happy when you see the prices. You would be amazed what you can find at a garage sale. A lot of times, garage sales happen because either the person needs some money, or they’re trying to remove clutter from their home. Sometimes if you get lucky, a pile of wood working tools gets put up for sale too. I frequent garage sales quite a bit and search for woodworking tools. It’s amazing what you can find sometimes, and it’s always a surprise. Take a look in the paper for some of the larger garage sales. Most of the really big sales will take out an ad, and estate sales will do the same thing. This is where your highest probability for finding woodworking tools exists, because the sales are so much bigger. Estate sales are also really good because when a family sells off an entire house, like when a loved one passes away, you have a higher chance of finding different items. I know I’ll be swearing up a storm in heaven if my kids ever sell all my woodworking stuff, but it happens all the time. Frequent some of the sales, and see if you can find deals. You usually can, and the benefit is that you might even find some other tools that you didn’t really know you needed. Pick those up on a deal too, and you can fill your woodworking shop without spending a ton of money. You can find great deals on clamps for woodworking in discount tool stores, you just have to be a little extra cautious about what you buy. Discount to stores are great for a lot of reasons, but they also sell a lot of junk too. It’s important to be careful when you’re buying woodworking tools from a discount tool store. Make sure that you pick them up, play with them a little bit, test the mechanisms out, and do a cheesiness test. Yes, you read that right. If your gut tells you that the tool feels flimsy, or poorly made, heed that warning. Look at the plastics, and see how well they’re manufactured. Take a look at the metal, and pay attention to joints between materials. In general, if your gut tells you that the tool looks like a piece of junk, don’t buy it. You trust your wood clamps with a lot of responsibility as a woodworker. If you feel like the clamps at the discount tool store are junk, definitely don’t ruin a project by bringing them home. That being said, sometimes these stores have access to certain product lots that are made by nicer manufacturers but liquidated for various reasons. In a case like this, you might find an unbranded clamp that feels high-quality, and you can buy that for a discount. Finally, one of the absolute best ways to get a deal on your clamps is to just make them yourself in your own shop. There are a lot of great plans online for making clamps, and one of the easiest is called a cam clamp. This is a very simple clamp to make, and the materials are inexpensive. You can make clamps for a few dollars a piece, and they would normally retail for about $20. Not only do you get discounted clamps, but you also get a fun woodworking project. There’s something really special about making your own tools and clamps. When you look up at that wall with clamps lined up in a nice row, and know that you made them all yourself, it makes you feel very good as a woodworker. You’ll also feel like those clamps work better than others, and in a lot of ways they do, even if it’s mostly mental. If you enjoy making things, and you haven’t made any tools for yourself yet, this is really where I recommend you get your start. The link at the bottom of this section shows my cam clamp building method. It’s a very versatile clamp, you can make it with any throat depth or opening height that you like. Head into the shop and make a bunch of these clamps. Make the first one completely, and work out any little bugs that you find in your process. After that, set up a manufacturing run and blast out 20 or more. Now that you know six different ways to find deals on woodworking clamps, it’s time to take action. Head out into the shop and either make your own clamps, or start looking for discounted clamps from the places that I recommended earlier. Woodworking does require a lot of clamps, but you can do quite a bit to make it easier on yourself to handle the cost. If you have no intention of making clamps yourself, and need clamps right away, I recommend starting on Amazon. If you’re reading this and it happens to be near a holiday, like Christmas, or Father’s Day, then I recommend heading over to the home-improvement stores and checking their stack outs right away. Go quickly, because people like me tend to buy quite a bit. If you have any questions on these awesome strategies for buying woodworking clamps at a discount, please leave a comment and I’ll be glad to answer them. Happy building.